Turns out Peter Hook’s Freebass may not be the only Stone Roses/Smiths collaboration afoot: Ex-Roses vocalist Ian Brown this week told the BBC he’s planning to write and record an album with Johnny Marr, the Smiths’ erstwhile guitarist. 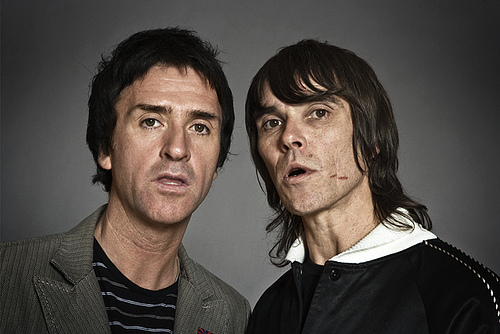 According to Brown, he and Marr hope to write soundtrack music for a friend’s in-the-works TV series: “The idea is that Johnny writes the music and I write the words and melodies,” Brown told the BBC. He added that they may enlist former Roses bassist Gary “Mani” Mounfield or Paul Ryder of the Happy Mondays to fill out the group’s sound. This week saw the release of Brown’s sixth solo CD, My Way (check out video below of the singer covering “All You Need is Love” at an album-release gig Monday night), while Marr continues to lend his six-string talents to acts such as Modest Mouse and, most recently, The Cribs, which released its latest, Ignore the Ignorant, earlier this month. Whooaah!! Hell yeah! they should have done this 15 years ago!!! Looking forward to it!